The end of a football season is a day of mixed emotions. For some fans there will be the euphoria of promotion, the nervousness of not wanting to be totally embarrassed playing at a higher level next season, whilst for others there is the dread of relegation, the gnarling feeling that your team is too good to go down and that immediate promotion is so much of a certainty they may as well not relegate you at all. For the vast majority of us though it is simply a time to breathe a big sigh of relief that another campaign of broken dreams and false hope has ended. “Next season, it will be all so different” we tell ourselves, knowing deep down that apart from the odd result here and there, it wont be any different at all. In fact it will be exactly the same, with only the players names being different. In the Non-League world we have the added concern about whether the club we support will still be going come August. In the past nine months a number of teams have simply given up mid-season, realising there is no future for them. Spare a thought for the Eastwood Town or Rye United fans who would have started the season will hope in their hearts only to see the club they loved vanish before the first signs of Spring. You can’t be a glory hunter in the grass roots game that’s for sure. 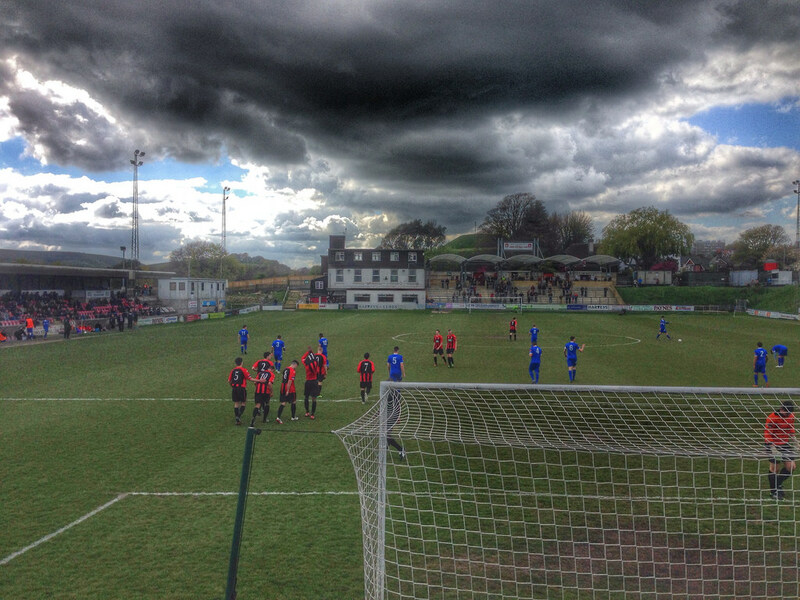 Today was my last visit to the Dripping Pan for the season (for footballing reasons anyway). With a work trip taking across the Atlantic next weekend, the visit of Bury Town would be my sign-off for the season. The lot of being a Director of the club however, does mean I will still be involved in the club every day of the Summer break. And what a Summer it promises to be. We have some big plans this year, plans that will hopefully see us start the long climb back up the Non-League pyramid. 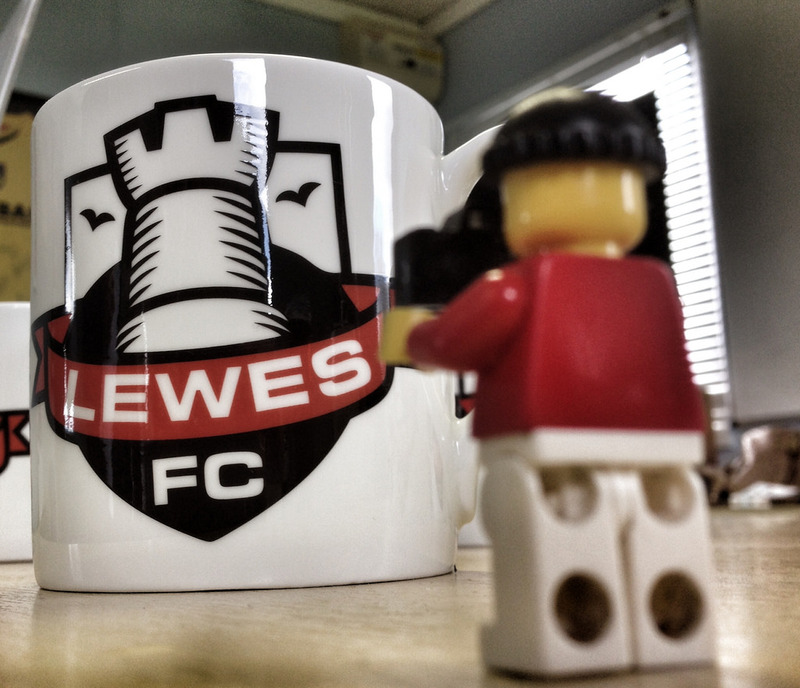 For us at Lewes it has been all about stability in the past few years, picking up the pieces of the broken Non-League dreams of our fathers and patiently gluing them back together to make sure they don’t shatter again. Get the off the field stuff right and on the field it will click into place. Our season has been no different to 75% of the rest of the Ryman Premier League clubs. We have had high points – a fourteen game unbeaten start to the season gave us all hope that this season could be the one, followed by six weeks without a game due to the weather that ultimately decided our fate. A mad March saw us having to play nine games, including matches against the six of the top seven in the division with a heavy injury list. Things got so bad that it was nearly time for me to polish up the Puma Kings. But our Premier League survival was ensured mathematically a week or so ago meaning that we would be living to fight another day next season. Planning for the end of season period starts around Christmas time. We need to ensure we have budgeted for all the essential work that needs to take place around the ground, including the pitch. Many fans forget that we have zero income from the end of April to July when we start selling Season Tickets, yet costs are still incurred. The land grab of trying to find a “big” club to come down and play in a pre-season friendly often starts a year in advance, and this year, without mentioning any names, we think we have pulled the golden rabbit out of the hat – I would say more but fear for my life from the wrath of Garry Wilson. A game against a big name side can generate a huge amount of cash for a Non-League club – a crowd of even 1,500 paying an average of £10 (inc food and programme) would be enough to bring in two or three more decent players for a season. Yet it is the hardest job in the world to get any of the big clubs interested – they probably received dozens, if not hundreds of requests to play against Non-League teams every season, each one as deserving on paper as the next. There’s no better place to watch a game when the sun is shining than at The Dripping Pan, and with Brighton not having a game today the hope was a decent attendance. Sure, there was nothing to play for but pride and a mid-table league position, but at least there are no dodgy dealings going on akin to a Biscotto, the Italian term used for convenient drawn games at end of season which hinders neither side. Our attendances this season had fallen in the past two months with so many midweek home games but still we would finish the season with an average just over 500 – a figure higher than more than 60% of the teams playing in the Conference North/South. Everyone was looking forward to the game. After the win in midweek this was a banker walk in the park. And then our mood changed. At the side of the pitch was Patrick Marber. The doom-monger. 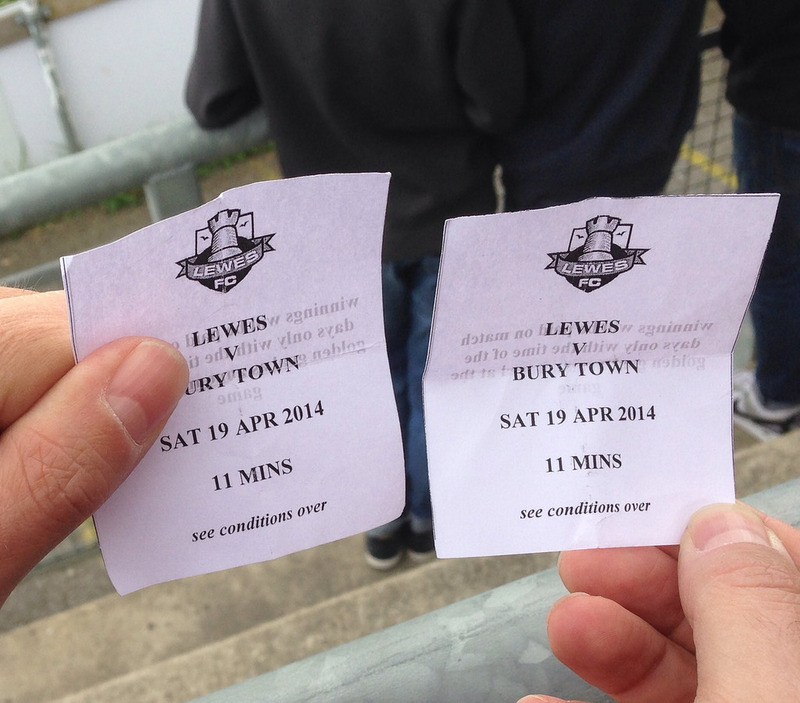 The curse of the Lewes win. If we had any sense we would have left there and then and headed down the road to Whitehawk for the afternoon. His track record of not seeing us win this season played on all of our minds. Despite his place in the Lewes Hall of Fame somewhere in the past few years he had brought a curse across the Pan whenever he visited. Dave suggested we all pissed on him to remove the spell and had to be forceably stopped dropping his trousers on the Jungle as the game kicked off. 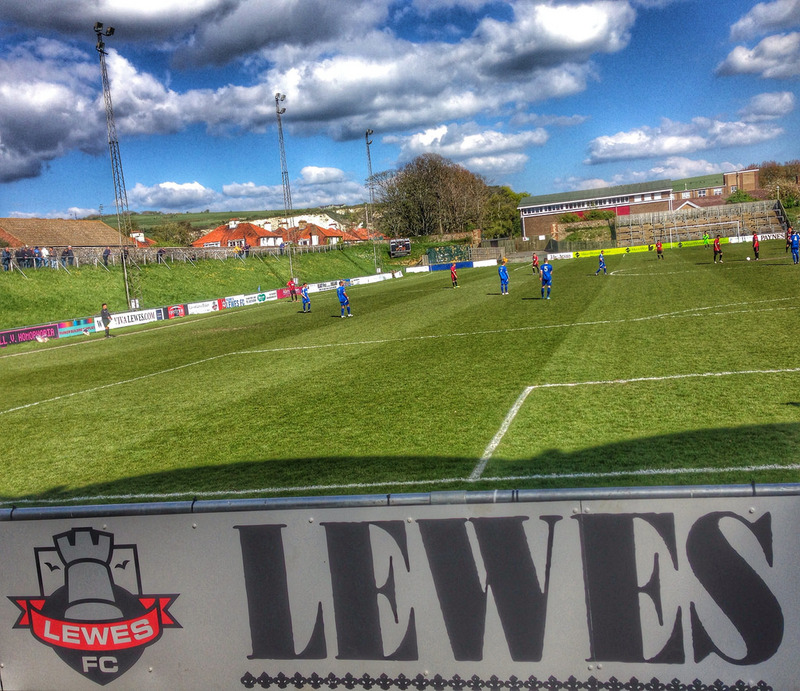 Lewes 1 Bury Town 4 – The Dripping Pan – Saturday 19th April 2014 After 30 minutes there wasn’t anyone in the ground who thought this wasn’t going to be our day. Winning one-nil thanks to Joel Ledgister’s sixteenth minute headed goal, and Rikki Banks having saved a harshly-awarded penalty when the Bury forward ducked his head into Malins clearance, it was the best day ever. The sun was shining, the Harvey’s was a perfect temperature and even Patrick Marber was admitting the curse had been lifted. And then it went wrong. Just before half-time Bury Town’s Wales stumbled into the area, picked up a deflection or two and manage to stab the ball passed Banks to equalise. It hadn’t been the best of halves, enlightened only by the goal, penalty save and the heated debate between Marber and Lord Plumpton about the fact both held the same Golden Goal ticket. If the first half was low on excitement then the second was utterly forgettable, at least for the Rooks. Ten minutes in and Allen smashed the ball into the roof of the net to put the visitors into the lead. Five minutes later and the referee was once again called into action to make a big decision, this time deeming Jack Dixon’s tackle on Bennett was late and dangerous, although the influence of the two Bury centre-backs who ran 70 yards to give their opinion seemed to sway his opinion that is was a straight red and not just a yellow. The goal meant Lewes had to throw on the not fully fit Nathan Crabb up front and pull Blewden into midfield. Bury simply stepped up a gear and scored two more without the Rooks ever threatening the visitors goal. Chants went from “sack the board” to “say away Marber”. But like water of a duck’s back he vowed to be back next week for the visit of Leiston. It was a disappointing end to my Dripping Pan season but I would be back (well, I have to as we have bi-weekly Board Meetings) next season, which would undoubtably be the best season ever.